The 942 Crew has announced that its next major Curtain of Distraction star will be “It’s Always Sunny in Philadelphia” star Charlie Day. 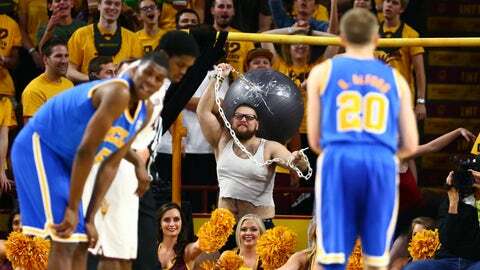 In the past two seasons the Arizona State student section, the 942 Crew, has featured major celebrities in the Curtain of Distraction including 23-time gold medalist Michael Phelps and rap artist YG. On Feb. 8 against the California Golden Bears, actor Charlie Day will join the list. Day, 40, currently stars in the FX series It’s Always Sunny in Philadelphia and is will star alongside Ice Cube in the new Warner Bros. movie, Fist Fight, on Feb. 17. The 942 Crew first sent waves through the student section spectrum on Jan. 29 when Oregon State guard Stephen Thompson Jr. stepped to the free throw line against Michael Phelps, the most decorated Olympian of all-time. Thompson missed both free throws as Phelps dazzled Wells Fargo Arena while sporting a speedo and an ASU swimming cap. The 942 Crew is now in its fifth year with an original goal of improving student attendance at basketball games. In the five years since, the Curtain of Distraction has taken off into national news, garnering the attention of ESPN and USA Today in addition to a prime time appearance on SportsCenter, becoming the first student section to appear on the show. Arizona State and Cal will tip-off from Wells Fargo Arena at 9 p.m. MST. The game can be seen on ESPNU.